[5 Stars] I'm not a coach but I love keeping scores. Thanks! [4 Stars] Just had a tournament this weekend and used this. It has worked very well so far... Very happy with my purchase. 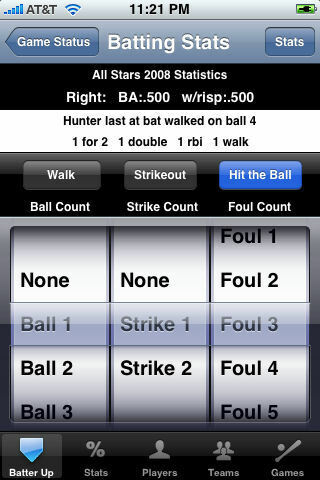 Baseball HittingTracker is an application developed for the iPhone. 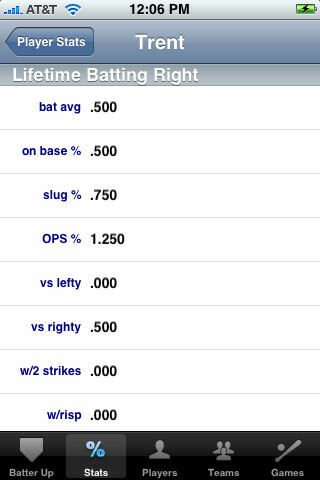 The HittingTracker aims to be the most detailed hitting statistics application available on the iPhone. You'll be able to track singles, doubles, triples as well as game winning hits, on base percentage and batting average with runners in scoring position. You can use the HittingTracker during a game to easily track statistics. 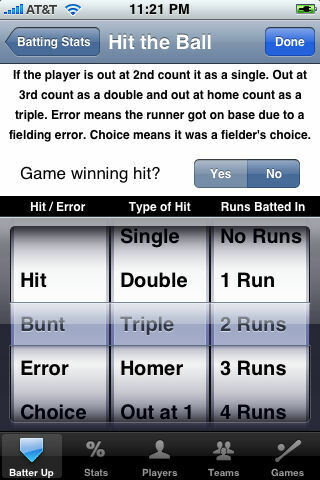 However, you can just as easily use it after the game to enter all the hitting information from your scoring book so that you can have all the statistics at your fingertips for your next game. You can edit players, teams, games and seasons so it can be used to manage your team as well as tracking statistics. 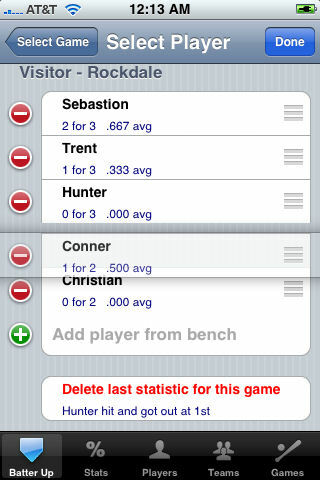 You can even change the batting order for each game and put players on the bench that aren't hitting. You can switch between "Quick Mode" and "Advanced Mode" when entering statistics. If you're not interested in tracking outs, balls and strikes, runners on base, etc. then you can select "Quick Mode". You'll be able to enter statistics with a single touch. 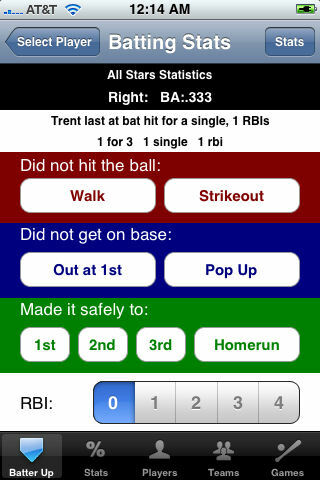 New in version 1.1 walks, hit by pitch, sacrifice flies and sacrifice bunts are not considered official at bats. Seven new statistics are also being tracked: Homerun Ratio, Base on Balls %, Strikeout Ratio, Runs Scored, Runs Produced, Sacrifice Flies and Sacrifice Bunts. 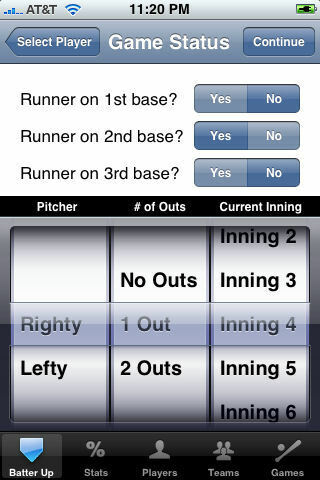 The "Runs Scored" statistic is tracked by a new screen in advanced mode that lets you select which players scored when one or more RBIs is tracked. New in version 1.2 is the ability to track stolen bases, export stats via a comma separated message sent to you via e-mail and team stats. Stolen bases are tracked from a single screen to make it quick and easy to track successful and unsuccessful atempts to steal. E-mail export is possible from the player stats and team stats screens using the e-mail addresses for the player and coach. Team stats are now generated the same way player stats are generated using the Calculate button. The team stats combine all of the player stats for the team. 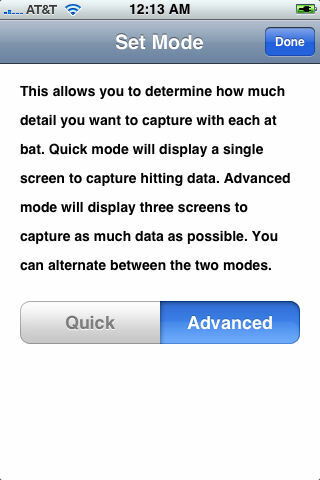 New in version 1.3 is the ability to the ability to archive your hitting data. You can easily switch back to your archived data and continue working on it at any time. Games are now listed by season to make it easier to navigate the games list. New in version 1.4 is a new button to make it much easier to track steals and runs scored when you are tracking a single player. Game statistics change based on the situation. For example, if the batter has two strikes then their season batting average with two strikes is displayed at the top of the screen! v1.3 - Ability to archive hitting data and start a fresh set of data. The previous data can be reloaded at any time. The HittingTracker is available on the iPhone App Store by searching for "hittingtracker". Once purchased for $2.99, it will download and install directly onto your iPhone and you'll be ready to begin! "The pitcher has got only a ball. I've got a bat. So the percentage of weapons is in my favor and I let the fellow with the ball do the fretting."